Sarah Comly 1825 [C6263] - $24.00 : Yarn Tree, Your wholesale source for cross stitch supplies. 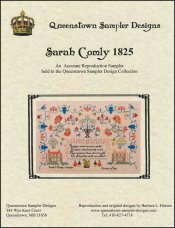 Cross stitch chart from Queenstown Sampler Designs. The three-sided border has a winding vine of rosy carnations, teal blue leaves, cornered with vigilant, plucky birds. There are typical Quaker motifs flanking a central floral basket, a cartouche with verse, and a pair of adorable ladies and gentleman in period dress on either side of a colossal squirrel. Clusters of carnations, birds on the wing, fruit baskets, checkered brick houses, and lovely Queen-stitched strawberries embellish the sampler. The verse reads, "Religion! What treasure untold Resides in that heavenly world! More precious than silver and golf, Or all that this earth can afford." Stitch count 160 tall x 240 wide.